Complete redesigned for ‘18 along with the rest of the Regal line, the GS gets sporty body work and the same great lift back as the rest of the line. The GS only comes available with AWD and GM’s 3.6 V6 with 310 horses and 282 lb-ft of torque. There are 5 exterior color choices. The color you see in the photo, which Buick calls Sport Red, is the only color that isn’t a $395 option. The other 4 colors are: Black, Silver, Dark Gray and White. There’s also only one interior color leather choice, Black. Inside you get sport seats with GS emblems in them. Other than the addition of sport pedals its pretty standard Regal fare inside. 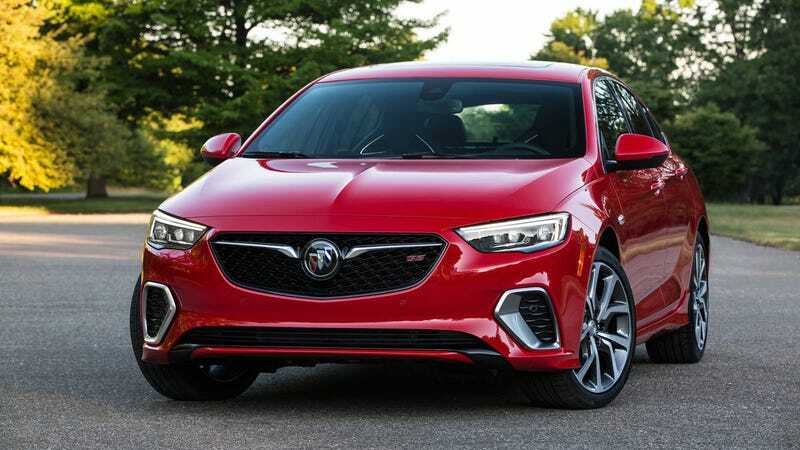 There are 4 option packages: A Driver Confidence Package that is pretty much a suite of driver aids like forward collision alert, lane departure warning and a hud costs $1690; $485 Appearance Package that comes with a wireless charging, cornering lamps, and LED headlights with autoleveling; A Sights & Sounds Package for $945 that includes Buick’s 8" touchscreen infotainment system, HD Sat radio and Bose 8 Speaker stereo system; and a protection package for $200 that comes with a cargo net and floor mats. I added everything but the protection package. The only options are a wheel lock kit, a license plat bracket, and engine block heater and and the pano roof which I added for $1000. Fully loaded with out all of Buick’s old person accessories, it looks like a GS will set you back right under $45 grand, or $44,110. Not bad, but at this price point its in league with better more capable sports sedans costing the same or a bit more pr cheaper used.